Very nice.Thanks,looks like I will be busy doing some downloading. But I have an issue in that I use a screen magnifier and I can't use Aero with it.So I would really appreciate the same kind of look as the Aero but without it. When I turn off my magnifier I can use the Aero but I can't read anything.It just looks good if someone else looks at the screen. 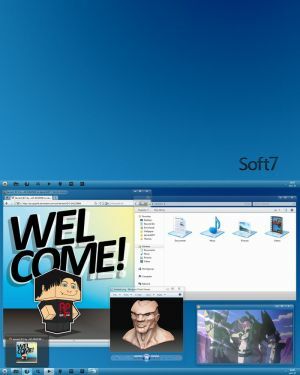 When I had XP I had no problem with themes,am partial to black themes,but Win7 Aero won't work because of a mirrored driver ,my screen magnifier,uses the video card. So if you could please post some non Aero themes that would be great. I get DeviantArt pics in my Google rrs reader and I get DeviantArt pics in my Google Photo Screensaver,Just for the pics,not for a screensaver,not needed on LCD screens. Cool, thanks Sergio! How about putting up some of Pauliewogs themes also mate? System Manufacturer/Model Number Self built. Its ok Bull no need to have Sergio go out of his way for me its cool! ***EDIT The answer is NO, just loaded WB4Win7 and it works fine. 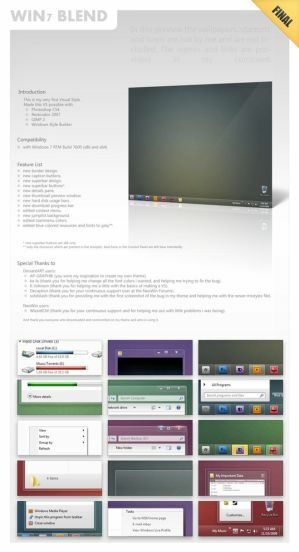 So i need to Mac OS X theme for my 7 .Where can i get MAC OS X themes? DID YOU JUST WRITE MAC!? I am looking now.Thank you..